TAKE A SMART MOVE TO GO AHEAD AS A LEADER. Indian industry is under a tremendous pressure from global competition. Profit margins have vanished in thin air as market forces decide selling prices, whereas input prices are exponentially increasing. Cost cutting is the key to survival. In today’s world the simplest way of cost cutting is to introduce new technology, increase the production within time with minimum manpower requirement. But this is not always possible with small or medium type of industries. Even not for the bigger size due to cut-throat competition. Hence we suggest to go with the taking an advantage of law of conservation. Our ancients were rightly said that use as much as you require but do not waste. We are concentrating on the essential part of any industry for conservation and that is energy. That might be in the form of electricity or thermal energy. No such industry can develop its base without any one of this energy and hence there is always possibility of wastage and conservation opportunity in the energy. Energy is often the single largest controllable cost in manufacturing. Proper management of energy has a direct positive impact on a company’s bottom line. 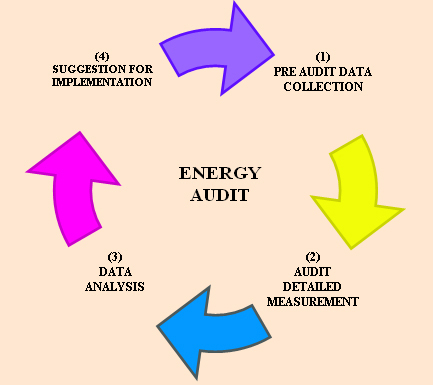 Energy audit is the first step in knowing the potential energy savings. It identifies area where the energy is being wasted by taking measurements at the key energy consumption points and the systematic study. It determines existing level of energy usage and recommends possible measures that would result in energy savings. Moreover the fact that the Energy Audit can identify the wastage and save a 15% of the energy bill. Ø Consolidation of energy and production related data. Ø Examination of energy conservation opportunities. Ø Comparison with the best industrial practices. Ø Recommendations and action plan for energy savings. This is most important phase for achieve real value of audit. This is one step forward to the energy audit process. 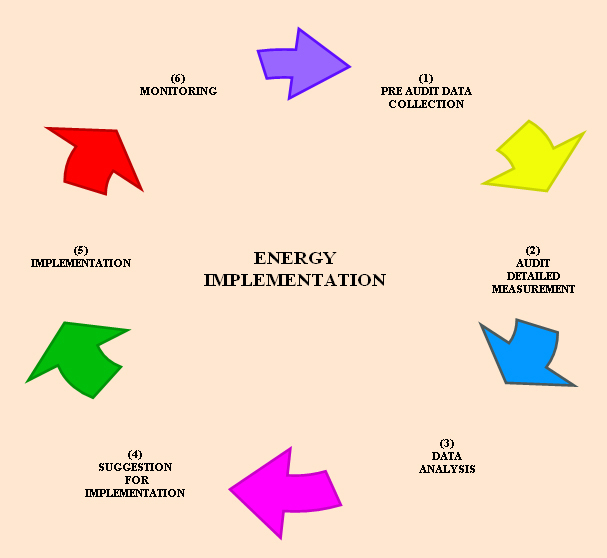 Here the step involves are same as energy audit with two more important step which gives you real benefit of energy audit. This is the continuous process as shown in diagram. HAVE YOU EVER THOUGHT ABOUT FOLLOWING THINGS? Ø Can I improve performance of my utility equipment? Ø How much my steam consumption? Ø How much my water consumption? Ø How much my air consumption? Ø Is it the best technology? Ø Can we improve our performance without big capital investment? Ø Can I save money without effect on production? We brought answers of all above question. Ø A 3 mm thick soot deposit on the heat transfer surface can cause an increase in fuel consumption to the tune of 2.5%. Ø 6 ˚C raise in feed water temperature by economizer/ condensate recovery corresponds to a 1 % saving in fuel consumption, in boiler. Ø A 3mm diameter hole on a steam pipe line carrying 5 kg /cm² would lose 1, 57,680 kgs steam per year which worth Rs. 94000. (steam cost Rs0.6/kg). Ø High efficiency motors offer of 4-5 % higher efficiency than standard motors. Ø Compressed air leak from 1 mm hole size at 7 kg/cm² pressure would mean power loss equivalent 4380 kwh per year which worth Rs. 21900. Ø 5.5 ˚C increases in evaporator temperature reduces compressor power by 20-25%.